I thought it would be fun to post the pictures of chocolate goodness I had taken. I’m a photographer, and there is something just sensual about that chocolaty goodness. I didn’t even think to post the recipe, because I was working from a book and I wasn’t sure about how to do it. And more important, the book was in the kitchen and I was in the basement and walking seemed likely to be less comfortable than sitting and just posting more pictures. Carefully chop the square into eights. Reserve any severed fingertips for later reattachment. Dump everything else everything not solid chocolate (or fingertip) into a bowl and beat till smooth. 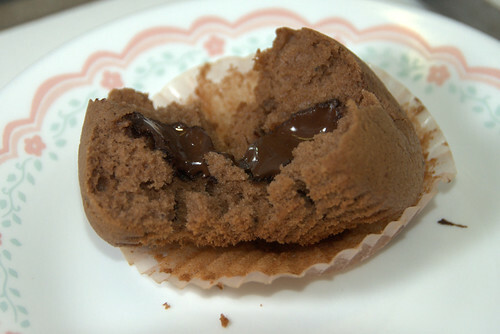 Put the paper cups into the muffin tray first, fill half way with dough, add a piece of chocolate, and top up. Preheat the oven and then bake at 375 for 20 minutes. Stand for 2-3 minutes, serve warm. You can dust confectioner’s sugar if you can wait that long. Stand over the body of your kill and savour the chocolaty life spilling into your mouth. Optionally howl at the moon or chandelier, as appropriate. Yes, I said savour. With a U. Eh? The major discovery that I wish we’d been warned about is that this thing produces batter so thick it’s almost dough. I thought we’d made a mistake when we added everything, and again when we saw how much my poor old egg-beater was whining about the work. We added a bit of milk which was unnecessary. Also, between the all-purpose flour substitution and the semi-sweet, it was a very dryly chocolate taste. Good moist cupcake, but very not sweet. Loved it. Tagged with food, life, recipe. Yes, thank you, I would like one!